ALDE (Alliance of Liberals and Democrats for Europe) have made some very constructive proposals for addressing the problem of people from Syria seeking asylum in the EU. In the UK the debate around immigration seems to swing between discussions of free movement of people within the European Union, “economic migrants” (who come to the UK and pay taxes here) and comments on those seeking asylum which swing between seeing them as threats and seeing them as people who deserve compassion. That mix mobilises lots of fears of “others” or “foreigners”, particularly among those with least actual experience of people from other countries. This is a toxic brew. It risks doing real harm. Many of these fears are irrational and acting on them would do damage, not least because an ageing population means we need younger migrants. Those seeking asylum seem to provoke the strongest fears: compassion argues for welcoming them, but it is almost as if we fear that they might be infectious. 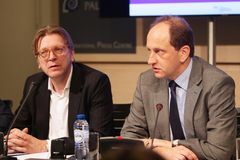 At the end of January ALDE Group leader Guy Verhofstadt and VP of the European Parliament Alexander Graf Lambsdorff made a very pragmatic proposal for engaging with the issue of people seeking asylum in the EU, which they are calling on the European Council to adopt when they meet on 18 February. What strikes me powerfully about their proposals is that they are eminently pragmatic, which means they are likely to work, and involve the countries in the EU working together to solve a problem. Verhofstadt and Lambsdorff made their proposal on the same day as Cambridge for Europe launched and Stronger In launched in the East of England. It provides an example of what we can do by working together at the European level but can’t be done by individual nations in isolation. Create a European Rapid Refugee Emergency Force (ERREF) with 2000 Border guards composed of European and national civil servants to manage the Greek border, the registration and screening of the refugees and to provide them with decent living conditions. Fast-track the setting up of European Border and Coast Guard (ECBG), multiply the budget for the border protection by five and overhaul Europe’s budget in 2017 to focus on solving the refugee crisis. The ERREF will be integrated in the ECBG. Take away the incentives to undertake dangerous journeys to Europe by agreeing on a new deal with Turkey: Two billion euros of direct financial assistance to refugees, one billion to the UNHCR to improve living conditions and education facilities in the camps. Make it possible to apply for humanitarian visa and asylum in the camps outside Europe. Upgrade hot spots to reception centres managed by the ERREF: which will function as transit zones, in which a distinction is made between refugees and economic migrants. Migrants with no perspective of international protection will return to their home country. Once previous actions have taken effect: Replace the Dublin Regulation with a new single European Asylum Procedure and put an end to discrepancy between Member States. Create a single European Blue Card for economic migration to allow migrants to cover the EU’s need for skilled and unskilled workforce. A European Peace Plan plus Marshall Plan for Syria, united European action to fight Assad and IS (Daesh), with full support to democratic Syrian opposition forces. I ran across your site site on google and check a few of your early posts. Continue to keep up the very good work. I recently additional up your rss. Seeking forward to reading more from you down the road!